As part of the Governator’s sweeping budget cuts, several state park facilities across California will be closed. Among these, Topanga State Park and Will Rogers State Historic Park—all due to be shut down because they aren’t making a profit for the state. It’s understandable our governor has an important task at hand—trying to balance the Golden State’s budget—but to close a park (Topanga State Park) that ranks 14th among California’s 134 state parks in annual attendance seems excessive. Topanga’s parkland entertains such vast numbers of visitors because of its close proximity to west LA (20 minute drive from Santa Monica). Despite how close it is to the concrete jungle, Topanga has an isolated, quiet feel, as if located much farther away. 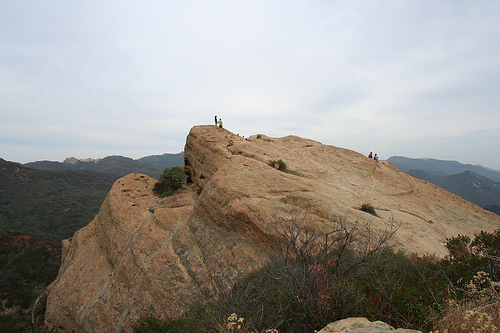 An easy 2 mile hike from the parking lot reveals Eagle Rock, a large, cave-addled sandstone monolith that you can climb on top of and stare in awe down its 200 hundred foot face—the only such formation in the entire Santa Monica Mountain range. The park receives innumerable visits every from K-12 public schools all over Los Angeles each year, which illuminates the notion that the park should be considered an educational facility, and its lack of profits justified for that purpose. Will Rogers State Historic Park is just as worthy to be kept open. This park is a piece of Hollywood history—it once belonged to legendary film actor Will Rogers, and has since been restored and opened to the public. Visitors can tour his 31 room ranch house, take horseback riding lessons, watch deer meandering on the golf course (an almost guaranteed occurrence), or venture into the mountains via horse-back, mountain bike or hiking boots on the famous backbone trail. These are just two of the 48 parks that will be closed under Schwarzenegger’s new budget plan. This dilemma begs the question: Should parks be expected to turn a profit? Their losses are a drop in the bucket, and are a small price to pay for keeping lands open to all that are prime examples of the natural splendor of the LA area before it became an urban wasteland. If you want to get involved, please read about the issue and/or sign the petition. Thanks for your information and I think parks are the best places for any one to have a pleasent mind. where we can learn lessons with a peace of mind. It is the minimum responsability of every human being to keep the park clean and green.